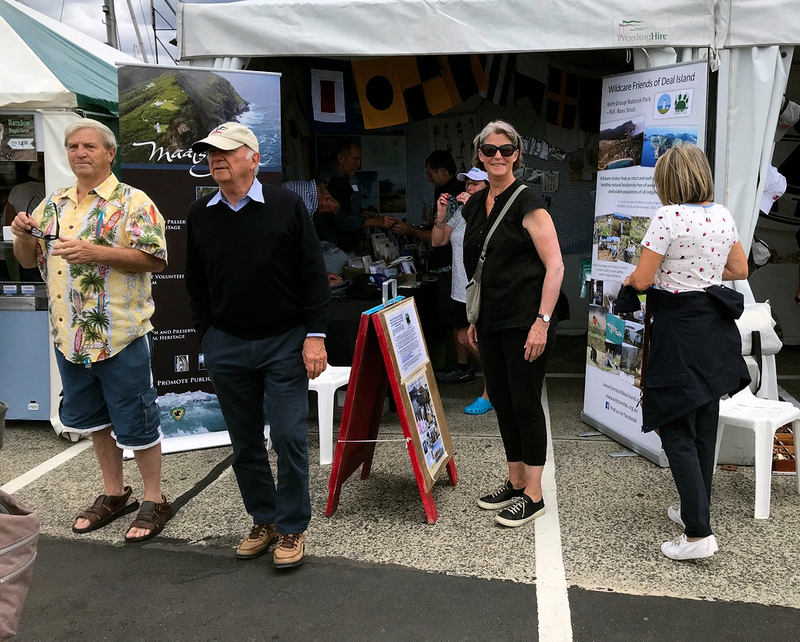 Thanks to financial assistance from Wildcare – Friends of Deal, Maatsuyker and Tasman Islands have had a long association with the biennial Australian Wooden Boat Festival. At our first Festival in 2011 we shared a tent with both Tasmar Radio and the Maritime College but at a later event the three groups had to hire their own. However, these days, facilities such as tents, tables and chairs are now provided in the price. The 2019 Festival got off to a good start. 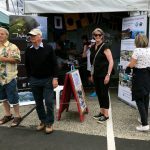 Squeezing everything into the confines of a 3×3 metre tent wasn’t easy but somehow it all fitted in, with a bit of space left for the hoped-for customers. 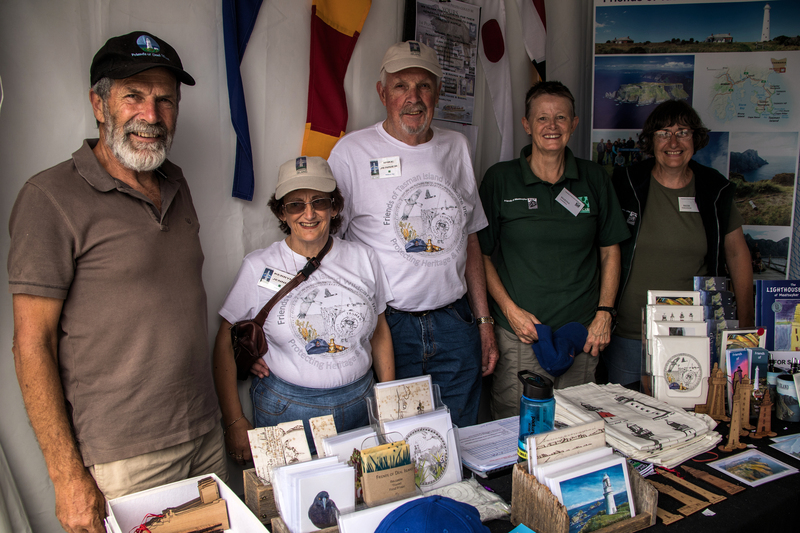 Through our participation, we hoped to increase the awareness of some of Tasmania’s more remote offshore islands and also raise funds for our work. 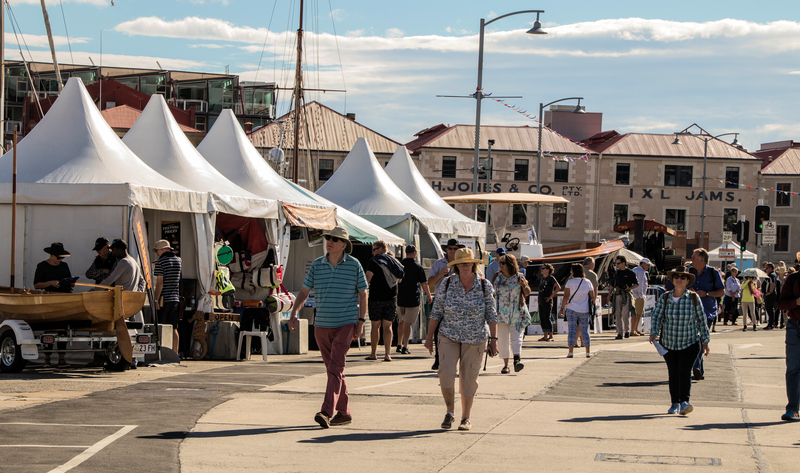 Friday – the first day of the Festival – was luckily fairly quiet as we sorted ourselves out. 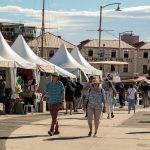 However, come Saturday, with the arrival of two cruise ships, crowds swelled and our tent was soon jam-packed with eager customers spilling out onto the concourse. Volunteers worked in shifts with representatives of all three groups stationed inside and outside the tent. Some were spruiking the raffle, others talking to interested bystanders. These included overseas visitors from the cruise ships as well as intrepid sailors with memories of delicious scones dished out by the friendly caretakers on Deal Island. Still more volunteers were handling the sales, squeezed in behind a table with its array of merchandise. In between time they, hopefully, found time to keep the sales spreadsheet up to date. 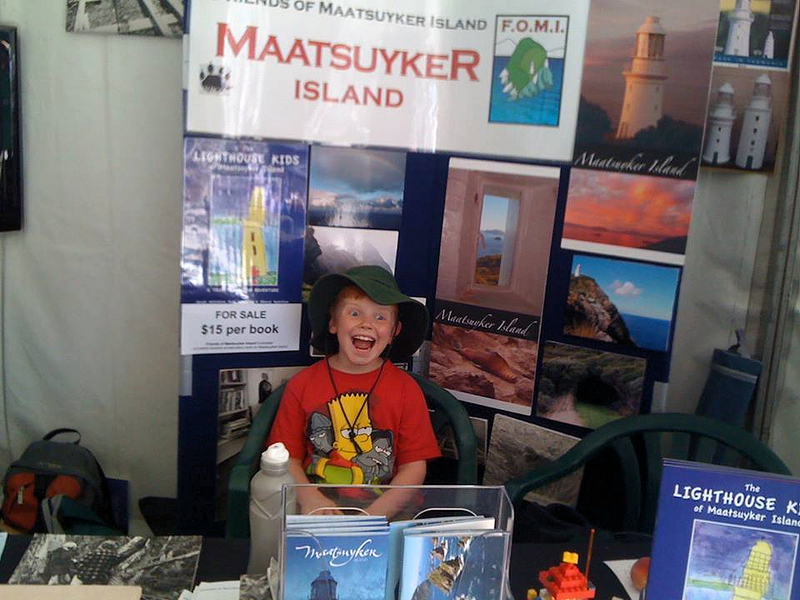 Sunday found Maatsuyker’s impending volunteer caretakers, Hannah and Grant, still in attendance. Perhaps getting their last taste of civilisation? 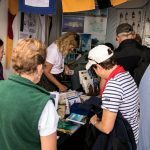 FoTI’s Erika Shankley had made it a family affair – spending the weekend on board son, Chris’s, yacht ‘Neptune’, on display alongside Elizabeth Street Pier. Volunteers had come from near and far with Mark, Nicky and Sue jetting down from the mainland. Sales were brisk. 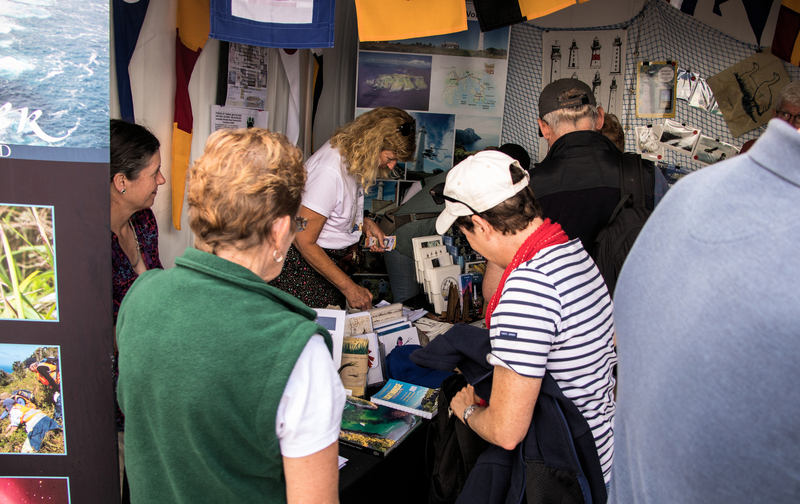 FoTI’s Lighthouses of Tasmania tea towels were the best sellers by a country mile – 146 being sold over the four day event. Wooden lighthouse fridge magnets, designed by Dave Davenport, were also popular and all three groups had an array of other merchandise and gift cards with island themes. It’s thanks to the donors of the fabulous prizes – Pennicott Wilderness Journeys, Osborne Aviation, John Ibbotson, Paul Richardson & Amanda Walker, Marlene Levings, David & Trauti Reynolds, Delamere Vinyard, Tintenbar & Lark Distilleries, Grandviewe, Woodbridge Smokehouse and the Wildare groups themselves – that the raffle was an outstanding success with all books sold. Late on Monday afternoon a small crowd gathered. There was eager anticipation as Wildcare CEO, Sharon Smith, delved into the bag held by Bob Tyson to draw the winning tickets. 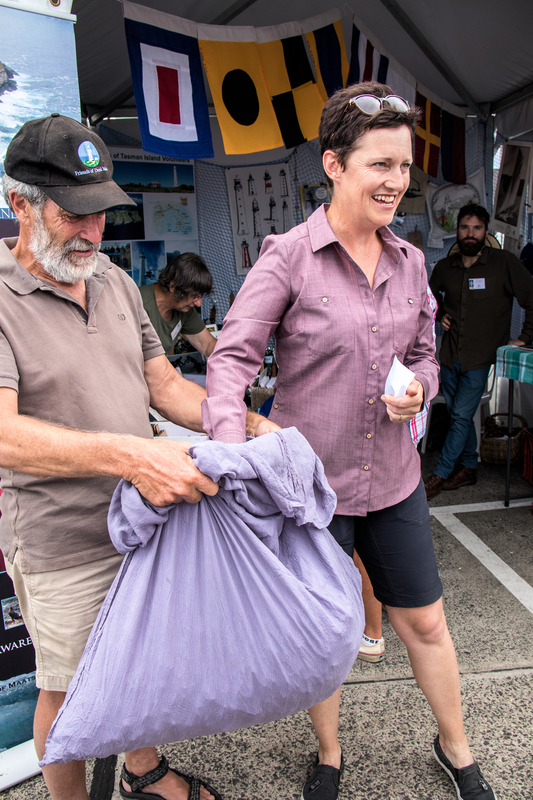 It was an international affair with the 3rd prize winner, Gaele Robertson hailing from France, while locals, Mike and Mel Tyson, Elise Chapman and Julie Schmidt shared the other prizes. The Shank, a book donated by Ian Johnston, was then auctioned in a brisk run of bids. Photo: Erika Shankley Wildcare CEO Sharon Smith draws the winning tickets with Bob Tyson. 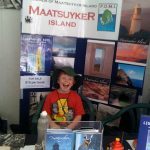 It was a most successful event for all three island lighthouse groups with a combined sales total of $4562 plus proceeds from the raffle of $3569 (before expenses) added to their respective coffers. 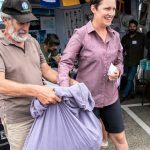 A big thank you to FoMI’s Ailsa Fergusson who did a magnificent job with the organisation and liaising with the AWBF; and also the 32 volunteers who helped over the weekend. 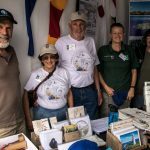 The Australian Wooden Boat Festival remains a worthwhile event, raising the profile of Wildcare and our lighthouse islands.